These guys can make Houdini look like a dime store magician. Siberian Huskies have the intelligence and swiftness that can rival this famous magician and have you blinking your eyes and staring in disbelief as they squeeze through the smallest of holes, break or chew their way out of a tie-out, kennel or crate and run through an electric fence like it was not even on! Some Siberians will actually calculate and plan their escape and it will be something that you NEVER even thought of in a million years! 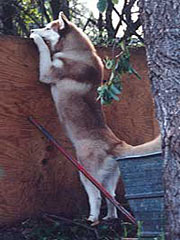 Some first time Siberian owners have witnessed first hand these Houdini escape plans. oh no, you lost site of her! As you increase your speed, with your heart ready to explode out of your chest, you see your other half pull up, open the car door, and your Angel jumps in ready to go for a ride. Even experienced Siberian owners learn quickly to anticipate any and every escape route and are usually always one step ahead of their swift and/or mischievous Siberian. These intelligent dogs are always learning new things, and FYI - monkey see monkey do! The more they watch you do something, the quicker they learn how to do it! We have seen Sibes who could open ANY door, including one that was dead bolted! 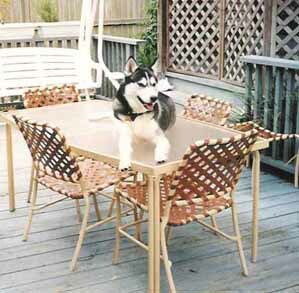 If you live with a Sibe you will certainly learn quickly that you have never seen it all. A Siberian household MUST learn the tricks of the trade quickly, before their Siberian does a disappearing act on them! Avoid leaving through doors with an intentional delay. If you must use them be sure you set it closed behind you. These doors offer an opportunity of which any red-blooded Siberian will certainly take advantage. The proper way to leave and enter your home is to ALWAYS do a head count and be aware of where your Sibes are when you are coming and going. We recommend that you place door latches up high. And always lock doors to the world outside, even if you are home! Youd be surprised what a Sibe can do when faced with a challenge, they thrive on them! ALWAYS use a semi-choke, gentle leader or harness when walking your Siberian, NEVER attach the lead to the collar, collars are easily slipped to go chase the neighborhood cat or an enticing squirrel. When getting out of the car, ALWAYS have hold of your dogs leash, lots of Sibes will jump right over you when a car door is open! If you have someone with you have him or her hold the leashes until you get out and open the dog's door and have the leashes securely. NEVER leave your Sibe outside in your yard unattended! Even a minute leaves them ample opportunity to jump or dig out and run free. "Ta Da! Ok now you can put the food up here too!"